Size of Baby: We got a great look at our little guy yesterday and he weighed 12 ounces. He measured at 20 weeks and 1 day. It's looking like he's right on track! How I'm Feeling: I've only had one headache (woo hoo!) but I did start having Braxton Hicks contractions this week. If I stay off my feet then it's okay but even just a walk through Target stirs them up. I also get pressure really low to go along with it. I just can't even believe that's happening already!!!! I talked to my doctor about it yesterday and she said it's just because my ligaments are stretched out now so it's normal for this to happen. I don't like to place blame but I feel as if this is Campbell's fault. :) Overall, I feel pretty good!! Cravings: No cravings. I never, ever want to eat dinner though. Sometimes I do because everyone else is and sometimes I just skip it. I was the same way with my first pregnancy. My stomach is getting squished and there isn't a lot of room for food. Clothes: No changes in this department. Movement: Lots of movement! I mostly feel him when I'm laying in bed at night. 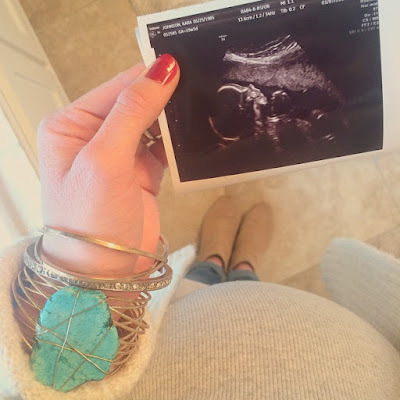 When we were doing our ultrasound yesterday, I saw him move on the screen at the same time that I felt a big kick in my tummy. I thought that was pretty cool! Baby Purchases: A lot of purchases this week!! I'm trying to not go overboard with the matching clothing but some things are so darn cute I just can't help myself. A few pair of Kickee Pants arrived in the mail this week that I'm super excited about. They're going to look so snuggly in their matching pj's! Yesterday I decided I just couldn't live without these adorable smocked outfits and I absolutely had to have them. These boys are going to be sweet and southern in all of their smocked Jon Jon's and bubbles all summer long and I could just explode from the cuteness. You all know how much I adore little boy clothes!! Favorite Moment This Week: Our anatomy scan yesterday was great! We got to stare at our little boy for about 45 minutes. I was disappointed because I feel like we didn't get a great look at his face so I wasn't able to really study what/who he looks like. He was showing out and doing some very impressive yoga poses for us. The ultrasound tech and my doctor said he looked perfect. To hear that we have another healthy baby is an amazing blessing. His heart rate was 132. Looking Forward To: Doing more to get ready for Bennett's arrival!! I started stocking up on some essentials like Little Remedies gas drops and gripe water this week. I also decided to get some Medela freezer bags too. 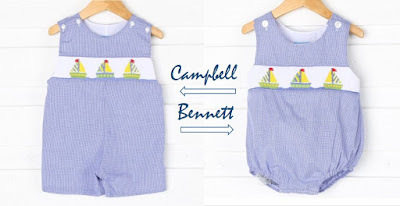 I went through those items like crazy with Campbell so I'm going to get one of each every month so I'll have plenty of them by the time Bennett arrives. I told Scott that I would love to be completely ready with absolutely nothing to do by the first of May. I want to enjoy the gorgeous spring weather and our last few weeks as a family of three without any stress. It would be so nice to get it all completely done, even little things like making sure we have gas drops. I'm going to spend the next few months trying to make that happen! This makes me so excited!!! Preparing for new babies is so fun!! And I love their matching outfits. It's so hard not to want to match all the time. I'm very guilty of it. It is so much fun prepping for new babies! I didn't think I would have as much fun the second time around but it's just as fun this time as it was last time! !